Good news! GameStop is getting a shipment of Nintendo Switch consoles in! And you can buy one, but only if you’re willing to plop down $599.99 to secure one. The Nintendo Switch has, so far, seemingly been a success for Nintendo. It’s already beaten the Wii U’s launch number in Japan,with similar numbers being reported in the United States and Europe. Getting one, however, as per usual in the early weeks of a console launch, is difficult. Pre-orders were long sold out before the system’s release, and though there were reports of consumers being able to just walk into a store and grab one the morning of launch, it seems that stock has run dry. If you’re willing to pay a premium, you could always try eBay, which is currently a scalper’s haven for the console. This kind of thing is common on eBay and is definitely frustrating, but to be expected. Hell, the NES Classic can still be found there fetching nearly as three times as much as its $59.99 MSRP. lady, the Switch is putting my kids through college! But what GameStop is doing, is absolutely unacceptable for a retailer. The total clocks in, before tax, at about $574.91, which makes their exclusive bundle about $25 more expensive than if the items were purchased on their own. This in and of itself is already annoying, but let’s say you get the smart idea to purchase the bundle and then return the items you don’t want? GameStop has you covered. Limiting their stock like this is an unacceptable practice on the part of the GameStop. Of course, the company is no stranger to controversy, so it’s not terribly surprising, but as of the time of this article, this $599.99 bundle is the only way to purchase a Switch console through GameStop. This means that GameStop has chosen to allocate whatever Switch inventory they have coming, specifically for this incredibly costly bundle. 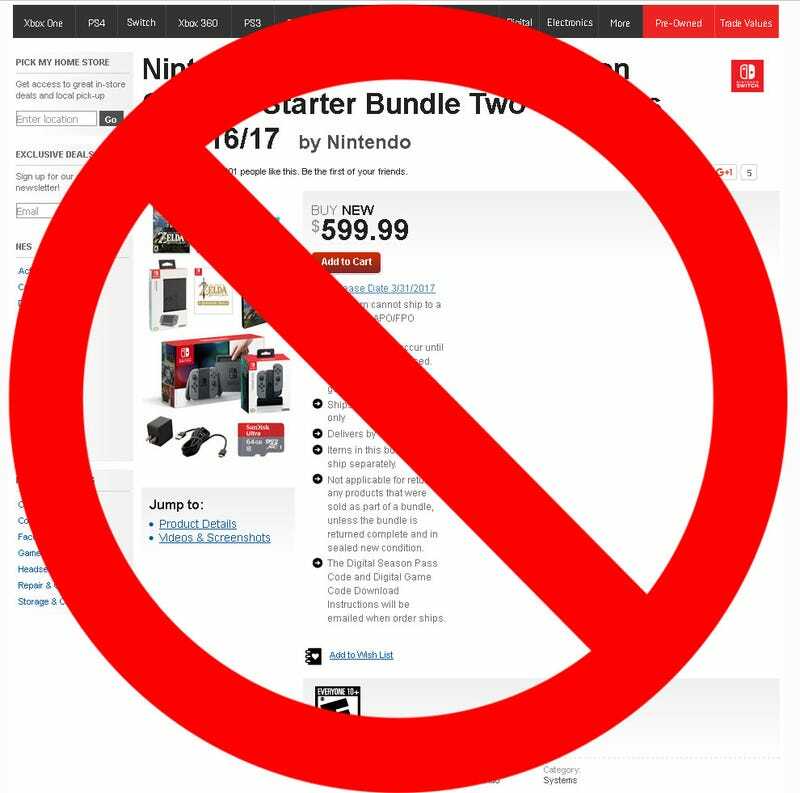 There’s no problem with them deciding to sell bundles, but don’t limit your only available inventory to the highest priced bundle that you can possibly come up with, especially when, at the moment, they seem to be the only retailer advertising a guaranteed shipment of the console. That’s not a good look. This is a predatory practice on the part of GameStop, bundling in nearly $250 of extra material that consumers might not even want, charging slightly more for all of it as some kind of convenience tax, and completely taking advantage of the system’s low supply with retailers. If you are someone that wants to purchase a Switch, and happens to want all of the stuff that it comes with, AND don’t mind dropping an extra $25 for all of it; great. More power to you. But if you’re anyone else, and you just want the Switch and maybe Breath of the Wild, do not encourage GameStop with your wallet. Buying this console sends them a message of, “Shut up and take my money, I don’t need to wait. I’ll pay whatever you want me to, I just want to Switch it up!” And they wouldn’t be offering this bundle if they didn’t think it would be lucrative for them. So, just wait. The console will be available eventually, and they can’t lock it behind this paywall forever. Do not encourage this behavior! Besides, there’s been reports of hardware issues anyway, so maybe it’s better to wait until those are ironed out. GameStop has not responded to request for comment as of the time of this article. It’s easy to get wrapped up in the hype of a new console, but do yourself a favor, and don’t give in to the people trying to take advantage of your excitement. Your wallet speaks volumes, and the best way to send a message is to speak with it, or in some cases, like this one, without it. What do you think of GameStop’s Nintendo Switch paywall? Are you getting one anyway? Or are you a GameStop employee? How has consumer response been to the Switch demand, particularly surrounding this preorder bundle? Sound off below, or shoot me an email at josephpatrick.gordon@gmail.com, I’d love to hear from you. Update: An earlier version of this article incorrectly listed the itemized price of the bundle at $575, when it actually falls in at $600 for everything. My apologies for the error.